In the past decade, tubeless tires have hit the bike scene in one of the biggest advances in technology (with wide-ranging side effects). In the last article, I dove into everything you need to know about tubeless tires for mountain bikes. This month I’ll weigh in on the latest tire technology: tubeless tires for road riding. As a quick refresher, tubeless tires are actually a system of tires and rims specially designed to not use an inner tube. Instead, a tubeless ready (TLR or TR) rim is designed to create an airtight seal with the TLR specific tire—without needing a tube. Most tubeless tires are designed to be used with a thin sealant inside of it to help self-seal and repair small punctures as well as make the seal between the rim and tire have an extra layer of air-tight protection. On the exterior, tubeless rims and tires look just like regular rims, so they’re usually identified with a “TLR” decal. On the inside of the rim where the tire bead (the thick part that stays hooked inside the rim) catches is extra stout to create an airtight seal. You can upgrade to a tubeless system on your existing road bike, but if you buy a new road bike there’s a good chance it will come with wheels and possibly even tires that are ready to be set up tubeless. Much like mountain bike tires, road tubeless has a few distinct advantages. The first being protection from small punctures. With a traditional tubed tire (usually referred to as a “clincher”), the only way to get fewer flats is to beef up the materials making it heavier and less supple. Tubeless tires are filled with sealant, so the small punctures that plague most cyclists (thorns, glass, the tiny wires of broken-off street sweeper bristles) are a thing of the past since the puncture is sealed within seconds by the sealant within. This can be a real advantage in a road race or training ride with friends. Tubeless tires can also be run at lower pressures without risking pinch flats giving you a more comfortable ride without compromising your ability to roll quickly. This is a good leg up for any rider—especially when cornering or on Oregon chip seal roads—and it’s a huge advantage for those that like to head into more adventuresome gravel and dirt roads where the surfaces are likely to be less than ideal. There’s some debate about rolling resistance (meaning how much energy you have to output to make the tire roll) when it comes to road tubeless tires. In most recent tests, it seems like lightweight tubeless and lightweight racing tires with latex tubes are neck and neck for the best rolling resistance. So if you’re a road racer worried about shaving grams, it all comes out in the wash.
Like their mountain counterparts, the cost of the rims is higher and the set-up is messy and pretty much requires an air compressor, so if you’re ready to spend a little on parts it’s best to let the shop handle installation. Of course, if you get a big enough cut in the tire tread you’ll be handling it yourself on the side of the road. In this case, the thicker, stronger bead of the tire can be extremely difficult to get off the rim (the narrower the tire/rim set-up, the harder it will be). If you’re not a confident tire changer with quality tire levers, or don’t have quick access to a lift, this might be a deal-breaker for you. The liquid sealant needs to be refreshed every 4- 6 months or more often in a drier climate, which is simple but another tick of maintenance. Tubeless tires need to be aired up a bit more often than your tubed tire, but this is a minor quibble considering it only takes a few seconds of time and most of us are checking our tire pressure before we head out for a spin. 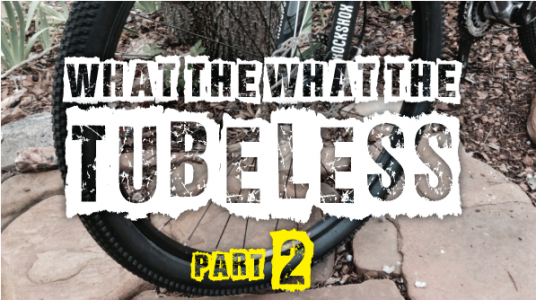 Why Would You Ride Road Tubeless? The best reason to ride road tubeless is because your new road bike came with tubeless ready rims and tires and it’s easy to step up to a higher quality ride. If you’re someone who’s a confident flat repairer and likes to head out into the wild blue yonder, wandering on the unpaved back roads of Oregon and Washington, tubeless tires can also be a game changer. Finally, if you’re just tubeless curious and have some cash to drop on new rims, tires and sealant, most people who’ve ridden them give them rave reviews for comfort, ride quality, and being puncture free. At this point though, road tubeless is made for extended road riding not commuting. While they do offer great protection from small flats, the rubber compounds aren’t up to tough, loaded commuter miles, so tubes are your best bet for now. Keep your eyes peeled, though. I won’t be surprised to see the technology eventually upgrade to encompass every type of riding. Tori Bortman is ORbike’s resident bike mechanic. She is also an educator, consultant and the owner of Gracie’s Wrench. Tori is the author of The Big Book of Cycling for Beginners published by Bicycling Magazine.